MyMemories Blog: Meet this Week's Featured Designer - It's *LouCee Creations*! Meet this Week's Featured Designer - It's *LouCee Creations*! My name is Louise and I have been Digital Scrapping for around 41/2 years now and absolutely love every minute of it. Designing kits has become quite a passion of mine, and I am always eager to learn new techniques. I enjoy using my free time getting creative, to me it’s a time for relaxation and most definitely a bit of ME time. I also love creating hybrid from digital kits and make everything and anything from cards to albums to boxes. The two work so perfectly together and using digital kits just give my creations that extra unique and personal touch. I have two teenage children and am married to Pete, we have one very large unruly but lovable standard poodle, Pete and I enjoy taking him on long country walks together, we are lucky to live in the beautiful countryside in Derbyshire England which certainly makes walking a pleasure. She has put her WHOLE SHOP on sale for this special week at 50% off and a great collection of items for just $1.00!! And she is giving away THREE $25.00 shopping sprees to her shop - so be sure to leave her some love and tell her what you like best about her shop at MyMemories.com! Remember to check out her FB page and blog too - MANY of our Designers have great blogs and do some fun exclusive giveaways on their own blogs - you don't want to miss ANY of the fun! and the LUCKY DUCK winner from last week's giveaway with Laura Burger is DEB RED - so if that's YOU, please send me an email to get all the info you need to claim your $25.00 shopping spree in Laura's shop! Congratulations, Louise, on being chosen this week! I am just starting with digital scrapbooks (as in, 2 weeks ago!) so I am mostly in the stage of looking to see how things are done. I love the real 3-D look of so many of your products, and can anticipate how I can use them with some of my favorite pictures. Thank you so much for this post. I want to let you know that I posted a link to your blog in CBH Digital Scrapbooking Freebies (please, notice the new url for my blog), under the Page 2 post on Jul. 30, 2012. Thanks again. Huge congratulations my friend. I absolutely adore your work. Thank you Lou for all you do to make our world a more beautiful place. Great kits! I've already chosen my faves. I like anything to do with gardening and genealogy so of course Recollection, Behind the potting shed, and Springville caught my eye. I also love the colors in Bolllywood. Great designs LouCee and congratulations! Congrats. Love the variety of kits you have. Something for everyone. I love taking pics and then finding an awesome kit to enhance my pics. I love your Bollywood Dreams kit. Love the colors. On the other hand the soft, gentle colors of Winter Romance are truly lovely. Thank you for your generositly. Somebodies are going to be oh, so happy! Love her stuff! thanks for the chance to win! Love your shop. I just downloaded the trial software a few days ago to evaluate as a possible replacement for former program. I am in the process of seeing what kits survived from the failed hard drive. 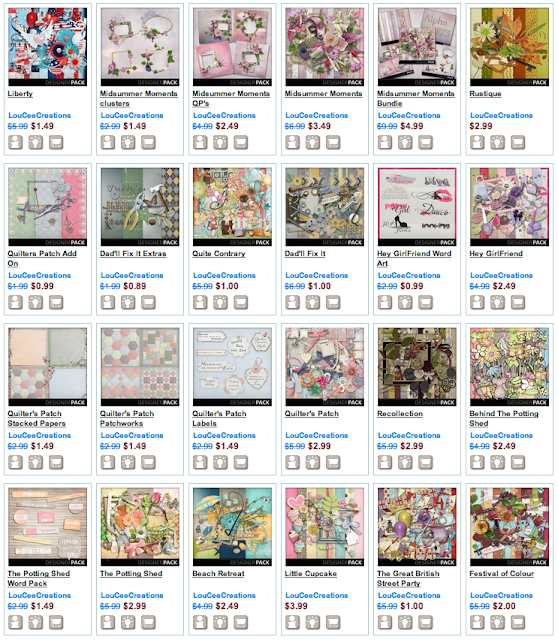 So many of your designs have great background papers, will be back when I know what I need! So far I'm enjoying my memories based on what I've played around with. Thanks for the introduction to Louise. Great designs and great sale too! Congratulations on being Designer of the Week. I love the colors that you choose to design with. Color palette is really a big decision for me in choosing what kits to purchase. Thank you for allowing us to get to know you better and thanks so much for the chance to win! Congrats!! You have many lovely kits, but I especially love The Potting Shed.. The kits all use GREAT colors! And I really enjoy the sale items too! i love your kits. they're all just gorgeous. with such a beautiful variety of elements. thanks for sharing about yourself. such wonderful kits! recollection is one of my favorites! I Just Adore Your Work!...I Love Your Flowers!...I Have Quilters Patch & All The Accessories!...It's Just Gorgeous! I like saving money so I look for the sales. My girlfriend loves this product and I save money. I love that you use a lot of pink and purple. With four grand daughters I love pink pink pink! Wow there are really so great deals at the shop you directed us...just find each and every thing at the best prices really...and lots of Congrats to DEB RED really from my side..! !